Lindsay Montgomery, alcohol and other drug prevention coordinator at Kennesaw State University, trains on how to use Narcan. Schools are saving lives by training faculty, staff and students on how to administer naloxone and providing free kits throughout campus and beyond. Opioid overdoses do not discriminate. They affect people of every age, race, gender and socioeconomic status. According to the Centers for Disease Control and Prevention, drug overdoses killed 63,632 Americans in 2016, the most recent year studied. Nearly two-thirds of those deaths involved a prescription or illicit opioid. Young adults are an especially vulnerable population, leaving college campuses at the crossroads of life and death. But schools are starting to take charge. Increasingly, colleges and universities are training faculty, staff, campus police and students on how to use the opioid reversal agent naloxone and providing them with free naloxone kits so they can act and save a life in the event of a suspected overdose. Naloxone restores breathing and responsiveness and can be administered either through a nasal spray, a prefilled auto-injector or injected via a needle in a syringe. Since 2016, Adapt Pharma (now Emergent BioSolutions) has been promoting affordable access to its Narcan Nasal Spray to student populations by offering a free carton to all high schools in the United States through the state departments of education. This program collaborated with the Clinton Health Matters Initiative, an initiative of the Clinton Foundation, as part of its work to scale naloxone access efforts nationally. In 2018, Adapt Pharma increased its allotment to two free cartons to high schools and expanded the initiative to eligible colleges and universities. Currently, the program serves approximately 1,773 high schools and 338 institutions of higher education. Following are how two universities are using naloxone training and distribution of free kits to help save lives during an overdose. 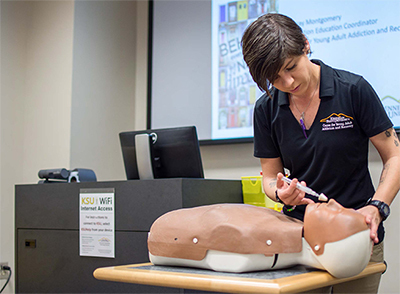 Since mid-2016, the Center for Young Adult Addiction and Recovery (CYAAR) at Kennesaw State University in Georgia has hosted training sessions on using naloxone. The 45-minute classes, taught by Alcohol and Other Drug Prevention Education Coordinator Lindsay Montgomery throughout the semester, give students, faculty and staff the opportunity to learn how to spot the warning signs of an opioid overdose, what steps to take when they see someone who might be suffering from an overdose, how Georgia’s 911 medical amnesty law works, what naloxone is and how to administer it. Students receive an instruction card and a pocket-sized naloxone kit containing a pair of gloves, a nasal spray with two readily available doses of naloxone and a card with Montgomery’s contact information. This is all free of charge to Kennesaw State community members who would like to be equipped and trained in administering naloxone. KSU takes overdoses seriously. Its police department was the first university police department in Georgia to be trained and equipped with naloxone kits. Class participants are taught to call 911 or the university’s emergency line first if they suspect an overdose. CYAAR also equips and trains all resident assistants with naloxone kits in the dorms on both its Kennesaw and Marietta campuses. An overdose occurs when too many brain receptors are blocked by opioids, preventing the signals to breathe and make vital organs function from coming through. “This is how an overdose can become deadly very quickly,” Montgomery explains. “An overdose will start with a decreased level of consciousness and continue to progress rapidly as vital organs begin to shut down. Someone who is experiencing an overdose will likely be very difficult to wake up, unable to communicate, may be sweaty or cold to the touch, have a decreased respiratory rate, and may show signs of hypoxia. 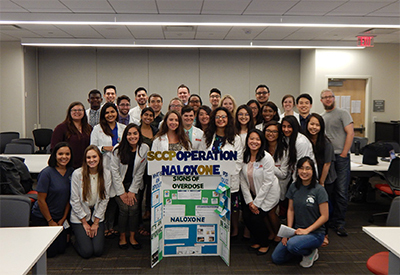 Student coordinators from the Student College of Clinical Pharmacy organization have partnered with Operation Naloxone to educate more than 500 Houstonians. Montgomery stresses that people who have a successful reversal still need to go to the hospital and receive ongoing care. Because naloxone wears off in 30 to 90 minutes, there is a risk that the person could go right back into an overdose if they have enough opioids in their system. People don’t realize that many overdoses occur in people who do not have an opioid use disorder, Montgomery says. “Many victims are older people who might have forgotten that they already took their medication and take it again or take the wrong dosage,” she says. “Also, there are first-time users who don’t know what or how much they are taking or pediatric victims who consume prescription opioids. Students at the University of Houston College of Pharmacy are on a mission to educate college students and the community on how naloxone can save lives. Since May 2018, student coordinators from the Student College of Clinical Pharmacy (SCCP) organization have partnered with Operation Naloxone (operationnaloxone.org) to educate more than 500 Houstonians and have established recurring training sessions throughout the community, including at high schools and recovery centers. To date, the student initiative has donated 17 Narcan kits to facilities where trainings were given. The coordinators of the program, which launched in 2016, are currently working to establish an official relationship with the university’s police department, residence halls, student health center and Cougs in Recovery as well as other entities around Houston. It’s also expanding its volunteer base. “This year, we are emphasizing the initiative as a broader outreach and want to have all students at our college of pharmacy to be involved,” says Katie Rascon, president of SCCP. The first step is for people to recognize the signs of an overdose and evaluate responsiveness through stimulation such as shaking or a sternal rub. They should listen for gurgling sounds or stopped or slow breathing. They should look for blue or gray skin, lips or fingernails or pinpoint pupils, and they should touch the person to test for sweaty or clammy skin. If an overdose is suspected, the person should respond by calling 911 and starting rescue breathing. Then, they should reverse the overdose by administering naloxone — more than once if necessary.